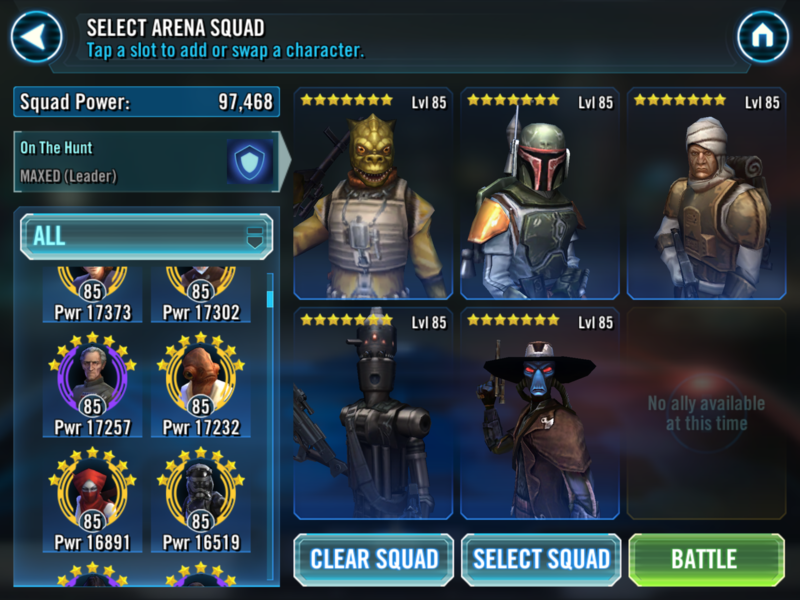 As of right now I run a bossk zeta lead with boba, cad, greedo, and dengar. At the moment only bossk and dengar are Zeta'd and bossk, dengar and boba are gear 12. I currently have chewie at 6 stars but I want to know if there are better bounty hunters to possibly replace greedo and cad for the next run possible like embo or sing or zam. You're good. I unlocked him at 7* with lesser geared bounty hunters. That's the same team I used too. It may take a few tries but there are plenty of guides on the forums that will help you finish it. Good luck! Though I used Boba(L), Greedo, Cad, Dengar and Zam to get 7 star Chewie, you might try Jango as well, if you've got enough money, time, gear and mods. Single revival from one BH's Resolve allows your team to soak up much more damage, and two BH's Resolve would soak up more IMO. Won a 6 star (6*) Chewbacca with a gear 9 zBossk (lead), gear 9 Bobafett, gear 8 Greedo, gear 8 Dengar, and gear 8 IG-88. I found it necessary to use Bobafett’s execute first on Chewbacca, then reduce Han’s turn meter next, and then taunt zBossk as the first 3 moves (in any order as long as it is the first 3 moves). After that, I was able to heal everyone from zBossk’s taunt and from going at Chewbacca first. After taking out Chewbacca first, most say to take out Han next, but in my case, Lando had high turn meter (about to go next) and low hp so I went after him and killed him next. Then, I went after Han, Leila, and then R2D2 last. Btw, RNG was involved, but eventually got it done in about 15-20 tries to keep everyone alive after their initial assault on my team. Feels good winning at a low gear level for sure! Hopefully, this helps someone else! Good luck! I did it with this order. Not that great of gear. IF you replace anyone, I think it should be cad. 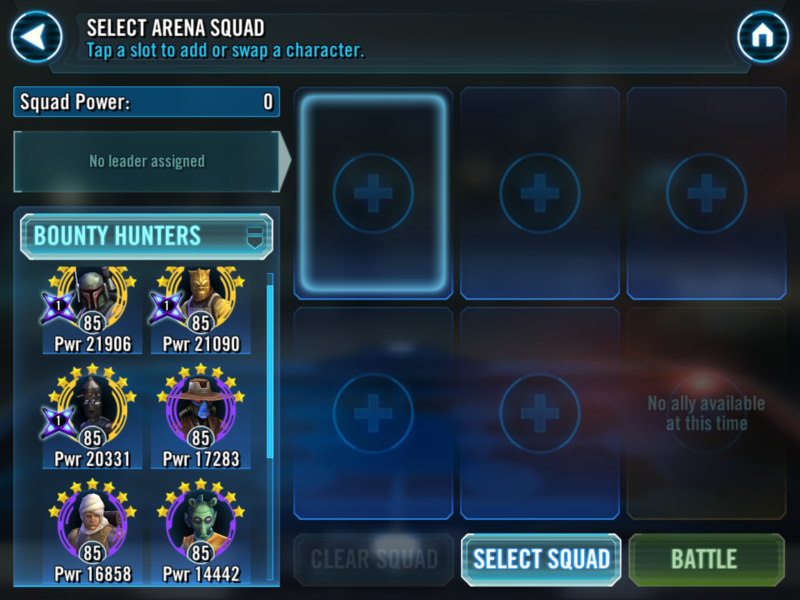 Greedo has an uncounterable aoe that will heal your team. Cad is surprisingly durable, and TMR + Stun is quite useful. Greedo is super squishy unless max geared, and his damage is streaky. Thoughts about a Bossk Boba Cad Dengar Jango comp? I am gearing up this time for now, but I have the time to switch toons before the next event if needed. @Eonixx That is what I am farming and gearing now. I am doing 16 battles/day each on the Jango and Bossk hard nodes. My thought are Bossk, Dengar, and Boba seem necessary unless you want to depend on RNG. Cad's stun/TMR will be very helpful, especially considering he has much more survivability than Greedo. Jango provides another life with BHR and puts out big damage, especially against debuffed enemies. I think it will work. I am aiming as high as I can for gear since I will be using the team after the event. Good preparation for the event, I guess we will hear about each other when next Chewbacca event will run.